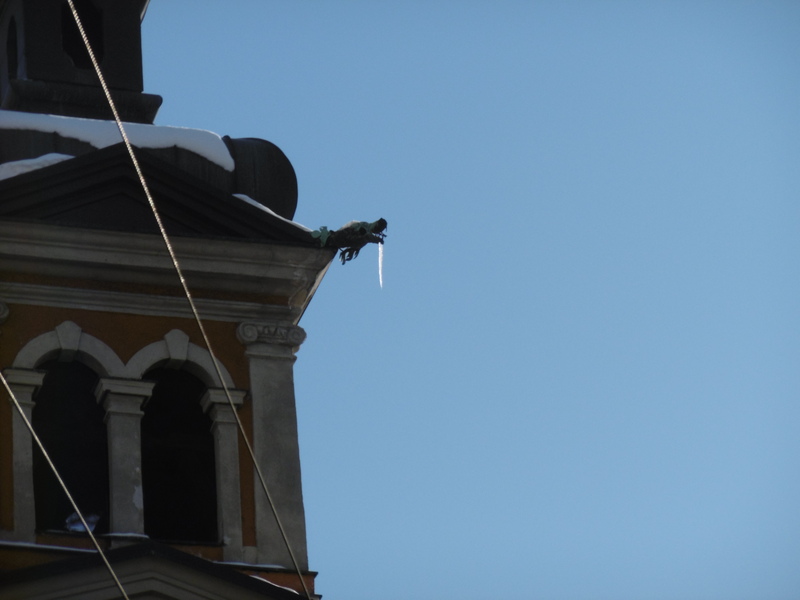 The dragon-mouthed waterspout on the former church opposite the Marktplatz, Innsbruck. Photo by Sean Manning, January 2017. A few weeks ago the Scholarly Skater asked “What beautiful old places are there where you live? Send me some pictures so I can enjoy them, too!” I took some photos in January which sort of qualify. Dog people know how dogs start to pant when they get too hot. Dragon people know that some species start to drool when they get too cold. While the days when the Tirolers spent all winter huddled in the parlor* or the kitchen are long gone, there is usually snow on the ground in the valley bottoms for a few weeks per year. The dragons sometimes get tetchy as they warm up, and have been known to spit ice at passersby. A former room-mate was injured by one of these spitting dragons. The City of Innsbruck has the street-cleaners keep careful watch on buildings where dragons are nesting, and leans colourful wooden poles against buildings to warn pedestrians not to approach until the cold weather is over. 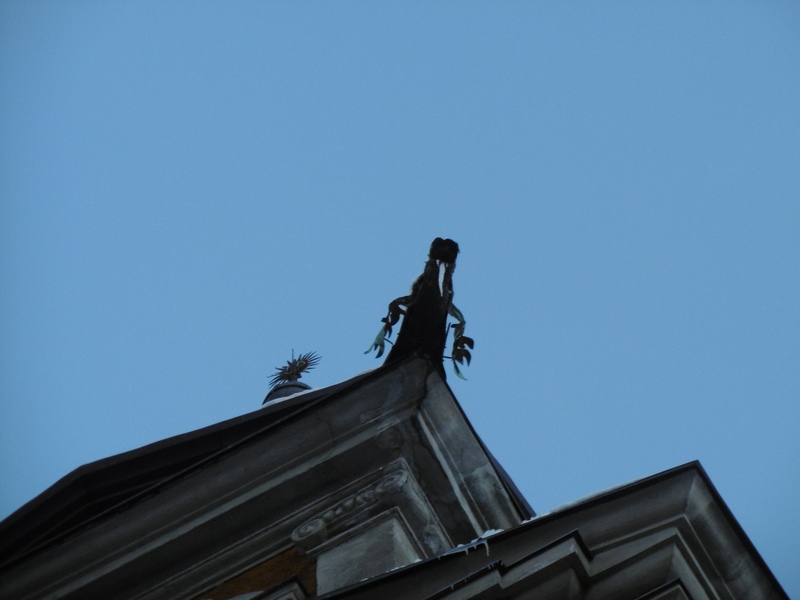 Another view of the dragon-headed rain gutter on the former church opposite the Marktplatz, Innsbruck. Photo by Sean Manning, January 2017. Thank you for sharing!! Those are awesome photos. I love the title too, by the way. Are there a lot of gargoyles in Innsbruck? Those copper water-spouts are pretty common, although I suspect that they are Neo-Gothic. I will have a look at the cathedral next time I walk by! I could probably do another post on Innsbrucker dragons one day. I am glad that you enjoyed it … and I will try to do more short, light posts this year.